NOTE from DearMYRTLE: The following was just received from our friends at FindMyPast.com. Please address all inquiries to that website. London, UK. 26th December, 2014. 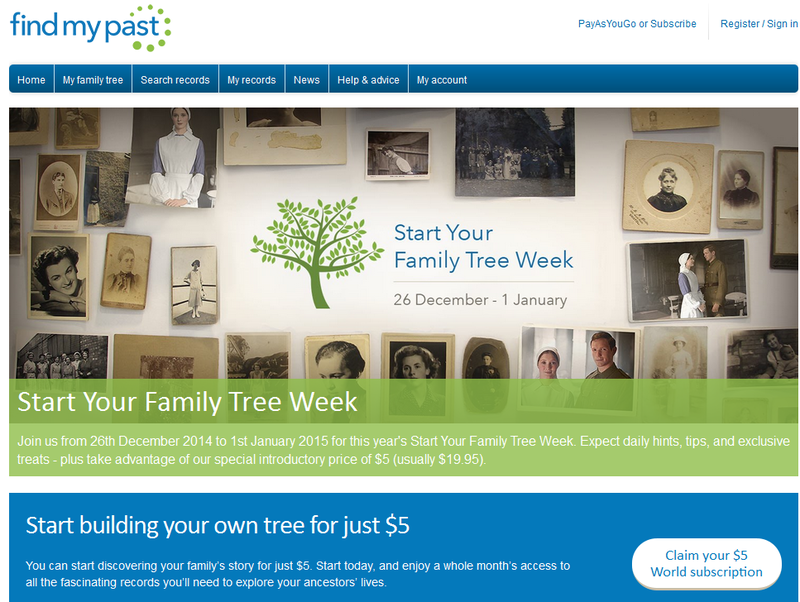 Today marks the beginning of Findmypast’s Start Your Family Tree Week and the release of over 7.6 million records. This seven-day event will continue until 1st January 2015. Over the course of the week, Findmypast users can access a wide range of materials to help them build their family trees such as getting started guides, expert insights, useful print-outs, and a wealth of family history prizes. Findmypast will also be launching its first ever Findmypast Tree Awards – a contest for the best family tree built or uploaded to Findmypast. Four winners across four categories will be selected by an expert panel of judges and will be awarded a selection of prizes. Findmypast’s Start Your Family Tree Week will include something for everyone, from beginners to expert genealogists. We have also released millions of fascinating new records to explore during this festive season. To find out more, visit our dedicated Start Your Family Tree Week page or visit our blog each day this week. Over 2.2 million New South Wales Births 1889-1914: a comprehensive index to the birth certificates from two distinct separate sets of records: the NSW Pioneers Index dating between 1788 and 1889; and the NSW Federation Index covering 1889 to 1918. Over 1.6 million New South Wales Marriages 1788-1945. Over 2.6 million New South Wales Deaths 1788-1945 . Over 11,000 Yorkshire, Sheffield Quarter Sessions 1880-1912. The court of Quarter Sessions was established in 1880 and its initial function was to hear criminal cases. The court sat every quarter, usually in January, April, July and October and, after each session, a Calendar of Prisoners was published to record the personal details of people tried at the session and their offences. Over 17,000 South Yorkshire Asylum admission records spanning the years between 1872 and 1910. Records can reveal not only when a patient was admitted to the asylum, but also the suspected cause of their insanity and whether or not they recovered. Over 45,000 Yorkshire, Sheffield Cathedral Church of St Peter & St Paul burial Index 1767-1812 records covering the period from 1767 to 1812. Over 41,000 Lanarkshire, the people of New Lanark 1785-1935 records. This collection was formed using all surviving Lanark church records (baptisms, marriages, communion lists, irregular marriages and cases of fornication), Sheriff Court and High Court records (small debt and minor and major crime) as well as the Lanark prison register. Over 90,000 United States, Revolutionary War Pensions containing the details of Revolutionary War veterans and their families. Pension applications for veterans of the Barbary and Indian wars can also be found. Visit our dedicated Findmypast Friday page to find out more. What does Ferguson teach the genealogy community?